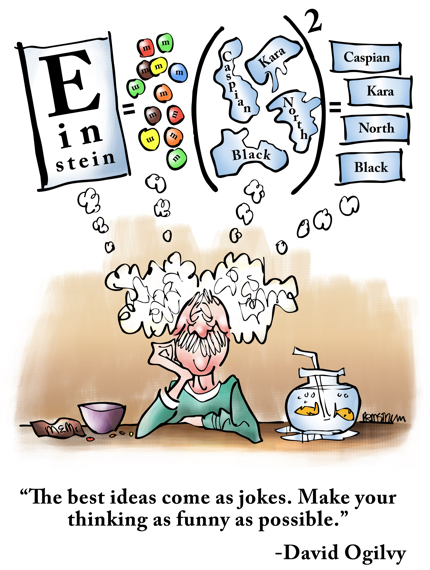 Ever wonder how Al Einstein hit upon his famous mass-energy equivalence equation? I got quite a thrill when I first came across that quote by advertising legend David Ogilvy. Humor inspires creative leaps. I’ve always believed that, and there’s solid evidence to back it up. Laughter makes it easier to think more broadly, and to free associate. Ever had an idea that was a little “out there,” but didn’t voice it because you were afraid of being judged? Or maybe you did some self-judging, and didn’t think the idea was good enough. Humor frees us up, so we can take a break from self-monitoring. the dots. Humor helps put us in a freer state of mind, making it more likely that we can “connect the dots” and solve a problem. Here’s a familiar scenario: you struggle with a problem and get nowhere. Total frustration. Finally you give up, and go do something completely different. Unbidden, a solution pops into your head. Or you come back and suddenly see the answer. Humor helps us solve problems the same way. It creates some emotional distance, which helps us relax and come at problems from a different direction. and humor. Does it pay off? Yes– literally. Ideas submitted by Southwest employees have saved the company millions of dollars. Ah!– you’re smiling! You got it. You had to think a little bit outside the box. And that’s exactly how problems get solved. Ergo: embrace humor. Make your thinking as funny as possible. Is humor an essential part of your content marketing and social media strategy? Do you feel more inclined to share ideas when you’re relaxed and having a good time? 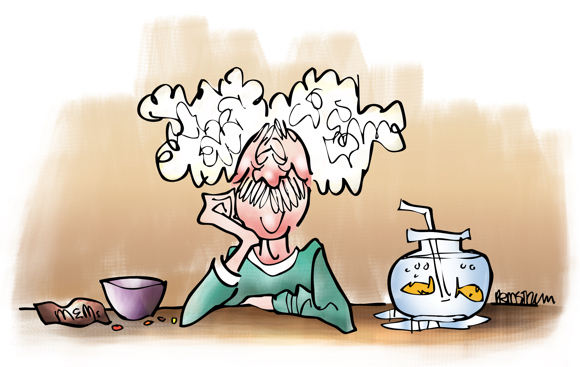 Do you think drinking out of goldfish bowls was what made Al’s hair so frizzy?? I’m keeping this comment short in case WordPress eats it…don’t want the platform to choke – LOL! WordPress has spared your comment!! O Happy Day! !– yuh done made it, RK!! This post made you freak out, but in the best possible way? ?– that is excellent news, none better! Laughter should be compulsory and it would be heaven on earth … !!! Amen to that, brother! !– and let’s hope it happens soon!! Talk about giving someone a good laugh–!! You really came thru for me, sir, and I appreciate it!! Hello my Dear Mark, I’ve missed you, but I’m back… Been ill, writing, and, in general, laying low… That conjures up quite a mixed bag (image wise). My dear Carolyn!! This is a joyful day indeed!! You have suddenly appeared in your magical, mystic way!! like the sun on the morning dew! like moonlight on roses! like– like– well, like a perfect dollop of mayonnaise on a flawless hard-boiled egg!! It rendered Archimedes buoyant enough (thanks to bath waters) to yell, Eureka, E = mc 2 !! Happy with his new ditty, he ran through the streets singing, Folks, Enjoyment = many chuckles 2 here at Dam Good Work!! My dear Radhika! I know you were very good at math– I can tell because your comments always add up, and your formulas exhibit good form while never being formulaic. Huh?? I wish I could be funny naturally like you Mark! As for growing any social media audience, it does help to at least have a light touch in comments if one can’t pull off humour naturally. Hi, Jean! Thanks for your lovely comment, but I’m quite sure you’re not giving yourself enough credit.